Today, as a lead-in to Mother's Day, moms from around the world are calling upon McDonald's CEO Don Thompson to stop marketing fast food to our kids. Together we will let McDonald's know that we are NOT "lovin' it!" "Well, if you don't want them to eat it, don't take them there! You're the parent, right?" True. But as any parent knows, some days are harder than others to resist. Not only to resist giving in to your kids, but also to resist the ease of getting a quick meal that your kids will eat, without even needing to get out of your car! enormous marketing budget. In 2010, McDonald's spent $115 million on advertising for just their Happy Meals! Also, sadly, for many families, McDonald's (which deliberately targets schools by opening locations nearby) is closer than a grocery store. And for those who don't have a car, it's often the only option they have some days. Well, don't all the kid-aimed product companies advertise to our kids? Even if I turn off the TV (and radio...) so that my kids aren't exposed to their ads, McDonald's designs its marketing to get around us at every turn! Schools are often exploited to market their junk food to kids too. School Districts can get paid $1000 for allowing Ronald to come visit the schools to "pitch health and wellness" to kids. And have you ever been to a McTeacher Night? Yes, it's great that some of the money goes to support your school. At the expense of our children's health, though? These events do far more for the company's brand trust and bottom line [and Mama's "bottom line!" Haha!] than they do for the schools. My daughter's preschool has a McTeacher Night fundraiser, and Ronald has come to her class and done a magic show each year there. I'm talking about 3-to-5-year-olds here. They aren't capable of understanding that they're being manipulated. Even if I could convince the school to stop, and forego that "free money," unless they all say no, it won't change a thing! Another way they sneak in is with kid-targeted online content, such as McWorld and HappyMeal.com. They also hire celebrity athlete role-models to promote their brand, such as gold-medal Olympic gymnast Gabby Douglas touting the new egg white McMuffin. McDonald's also spends a ton of money to be the "Official Fast Food of the Olympic Games," going so far as to have a restaurant in the Athletes Village. How can parents argue that these aren't healthy choices when kids see Olympic athletes digging in? Hopefully the controversy over this incongruity will cause the Olympics to re-think its food and drink sponsors. But that too will take us putting on the pressure. Why McD's? All the fast food companies peddle the same unhealthy foods, and offer kids meals and toys to our kids. Like many other fast food chains offering kids meals, McDonald's cross-promote with kids' shows and movies and familiar characters, ensuring that kids connect their current favorite icons with McDonald's. But because they are more popular (and on practically every street corner!) they have more money to lure in the larger, more popular toy and character franchises. But even Disney feels that this is too much, and has distanced itself from fast-food and its links to the childhood obesity epidemic. And while McDonald's DOES offer "healthier" choices such as grilled chicken wraps and salads, none of these are available in a combo with a toy. Because let's face it - very few kids are whinging to go to McDonalds for the food without the toy! Pressuring smaller fast food chains just isn't as effective. And it certainly won't get the attention of the big guys, who view parents as problematic "gatekeepers," guiding kids to healthier choices. But focusing attention on the largest chain there is will influence the others. Already franchises like Burger King and Taco Bell have responded to the awareness that movies like Fast Food Nation and Super Size Me have engendered, and are offering healthier menu items. As the parent, why don't you just teach your kids to just ignore the ads and make healthy choices? Kids are not just small adults; their brains are still developing and they cannot distinguish between marketing and reality. Even the American Academy of Pediatrics notes that marketing to children under 8 is "inherently deceptive" and "wholly exploitative." I have worked with my older daughter to teach her that commercials are out there to trick you into wanting what they are selling, so that they can make more money. She still gets roped in once in a while, but is annoyed that she was "tricked" by their marketing. But most parents don't do this, and many kids are alone or without their parent there to guide them when they see the commercials or meet Ronald at their school. My daughter knows that vegetables are healthy, for example, but insists that hot dogs are vegetables, and therefore healthy, whenever she wants one. If it weren't for her agreeing that cutting the gluten out of our diet has stopped her stomach pains, and deciding that she wants it to stay that way, it would be much harder for me to stick to a "no" whenever she decided that she'd like to go to McDonald's again. But again, sometimes she still insists that maybe it isn't the gluten, and can we go...please? And to top it all off, by its very nature, junk food is addictive. And food manufacturers have made a conscious effort to get people hooked on foods that are convenient and inexpensive. The human body's controls on overeating are fragile, and many processed food ingredients actually make people feel hungrier! Today, one in three adults is considered clinically obese, along with one in five kids. 24 million Americans are afflicted by type 2 diabetes, often caused by poor diet, with another 79 million people having pre-diabetes. Even with the knowledge that certain foods and ingredients are bad for us and our kids, clearly we can't even be trusted to make healthy food choices for ourselves anymore! We're not asking McDonald's to change their menus. We're not asking them to stop advertising their fast, convenient food to adults. But for Mother's Day, we would like a special gift: for McDonald's to stop marketing fast food to our kids! Together, hopefully we can put some pressure on the fast-food giant, and influence other franchises to follow suit! 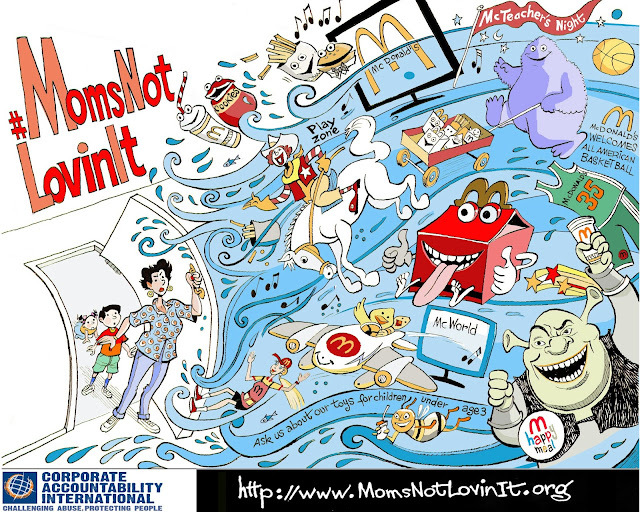 Go to www.MomsNotLovinIt.org to find out more!